CO2 trigger system with air cushion technology reduces the chance of injury in the event of a fall. 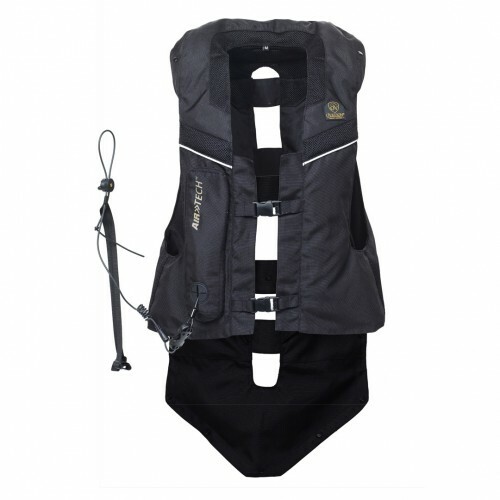 This lightweight, durable air vest is suitable for all riders and will inflate in the blink of an eye in the event of a fall. Can be worn with a conventional body protector for maximum protection. Suitable for 66 pounds and up. Each vest includes one cartridge. All equestrian sports are inherently dangerous and involve the risk of serious injury or death. Riders using these products ride at their own risk with full knowledge of the hazards and risks associated with their activities. 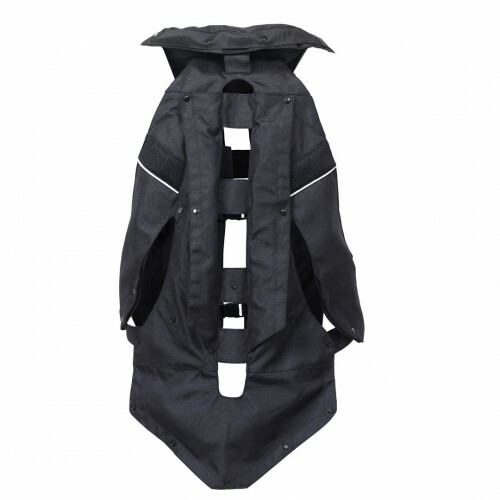 Body Protectors are designed for equestrian use only. Body Protectors cannot offer complete protection from injury or death to riders in case of fall, collision, impact, and loss of control or otherwise. Body Protectors cannot protect areas of the body that are not covered. Body Protectors offer no protection against injuries involving forces other than impact. CAUTION: Body Protectors must fit well and be securely fastened. Body Protectors are constructed so that the energy of an impact may be absorbed through partial destruction of the body protector. Body Protectors that suffer an impact should be destroyed and replaced. The protective qualities of body protectors may be compromised by prior impact, age, use and many common substances. Always follow the manufacturer’s recommendations before applying cleaning agents, paints, or adhesives. English Riding Supply disclaims any responsibility for injuries or death incurred while wearing any of the body protectors offered for sale. Representations regarding testing results, equipment ratings, product specifications, ASTM and/or SEI standards, and the adequacy of all such standards and designations are made solely by the product’s manufacturer. English Riding Supply does not warrant or confirm the representations of the manufacturers. English Riding Supply makes no representations express or implied regarding the fitness of these products for any particular purpose nor the extent to which the products protect riders from injury or death.